Now in it’s third year the Framlingham Sausage Festival has become an important date in the diary for sausage enthusiasts up and down the East of England. Framlingham itself is a wonderful market town with a great mix of shops. The Sausage Festival is cleverly designed to take you on a tour of the town ensuring you can make lots of discoveries on the way round. With 12 different sausage producers competing it really is a great chance to sample lots of different sorts of sausages and also to meet a whole variety of producers from around East Anglia. And it goes beyond sausages! This year there were lots of interesting trade stands enhancing the already lovely and varied Framlingham Market. I took the chance to grab a bottle of Scarlett & Mustard’s Ornamental Ginger & Soy Sauce. The recipe card I picked up with it has a wonderful sounding pulled pork creation which I am looking forward to trying out. People buy a trail map which also gives them their voting slips and, new for 2013, their limo rides around the town! 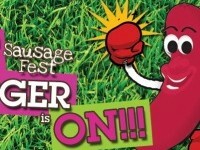 Sausage lovers can then sample their way around the town voting as they go so the winner truly is the People’s Choice! The sausages on offer were from a variety of producers around East Anglia and the standard was really very high. It was great to chat to people who were new to the town and the area and had been attracted by the sausage festival. There was also some great sausage innovation going on. At The Station pub they were taking the opportunity to show off their wood fired pizza oven which provides hot tasty pizza Thursday – Sunday. They had created a BBQ sausage pizza with caramelised onions which looked and tasted great. The Roadii XL was also on show cooking up some awesome sausages from Jimmy’s Farm. This innovative cooking solution, being used by more and more chefs in the area, is capable of cooking over 36 sausages at once! Not only is the Roadii a sophisticated and highly controllable cooking solution but it’s also largely built from recycled materials! And just when I thought the sausage festival experience couldn’t be improved I want to a cookery demonstration but local food hero and BPEX development Chef Alan Paton. Alan was cooking up a storm! I tried three different sausage recipes with sausages from Procters in Ipswich all designed to be simple, quick and tasty. Then I had a further treat with Alan’s french toast creation which has croissants, brioche and pork five ways in it! You can hear my podcast about the festival here. Watch out for future podcasts including my interviews with the Ladies in Pigs and Alan Paton. Volkswagen’s best selling product is … a type of sausage!